High Performance Wheels Market size was more than USD 11 billion in 2016 and is set to surpass 60 million units by 2024. Rising demand for luxury vehicles, sports and premium compact vehicles will propel the industry growth. Rolls-Royce, the premium luxury cars have witnessed increased sales, registered for more than 4,000 unit sales in 2016. Shift in automotive trends towards weight reduction, fuel efficiency and vehicle customization will drive the high performance wheels market growth. Increasing demand from the original equipment manufacturers (OEMs) due to increasing global automotive production will propel the industry growth. Global automotive production was over 94 million units in 2016. Necessity to enhance acceleration and smooth breaking system particularly in the sports car has supported the product penetration. Superior strength, low weight and enhanced visual appeal are the key properties stimulating the high performance wheels demand. Increased product usage in passenger cars, owing to its notable properties including optimum dimension, proper replacement, correct fitment and massive load carrying capacity will create new avenues in the forecast period. Overall automotive wheel market generated over 80 billion revenues in 2016. Moreover, consumer inclination towards better rides, improved comfort, and ease in handling will positively influence the industry growth. Technological advancements in wheel designs, aerodynamics, and wheel material are the driving factors of the product penetration. Optimum wheel rim dimensions ensure better air flow enhancing smooth braking system. Emergence of innovative materials including carbon fiber with improved handling, fuel efficiency and reduced weight will have positive influence product demand. High performance wheels offer reduced unsprung weight that minimizes unpleasant vibrations of the vehicle. Super structural wheel designs witnessed significant gains as they widely absorb impacts, soaking up the bumps and off-road impacts. Complex manufacturing processes with expensive initial set up cost is the key factor impacting the price trend. High product prices due to expensive raw material and production process coupled with cognizance may hamper the industry growth. Aluminum market will witness gains around 6% up to 2024. Superior mechanical properties including low density, corrosion resistance, durability, lightness, ductility, and malleability along with appealing appearance have enhanced the industry growth in this segment. Extremely low weight of aluminium enhances the vehicle fuel efficiency and eases acceleration. Magnesium market demand was over 12 million units in 2016. Magnesium alloyed with other metals offer improved vehicle performance, better acceleration, and shorter braking distance. Europe lightweight alloy market has witnessed growth around 25% from OEMs in the last four years. Carbon fiber will witness significant growth due to its extreme strength and reduced weight up to 40-50 %. Shifting trend for lightweight materials with a purpose to enhance weight reduction mainly in formula competition cars and sports cars has supported evolution of carbon fiber. Superior working under severe impact and fatigue condition have encouraged the product usage in high performance wheels market. Premium compact segment accounted for more than 50 % of the overall high performance wheels market share in 2016. Increasing demand for luxury vehicles coupled with technological advancements in the modern vehicle models will propel the industry demand. Changing lifestyle and vehicle style trends along with shifting preference for comfort and safety will drive the product development. Entry level luxury vehicles was over 11 million units in 2016. This segment includes bottom-end vehicles in the line-up of luxury brands as well as the top of line models of some non-luxury brands. The product has registered increased consumption from entry level segment due to its suitability to the engine and maximizing the interior vehicle space. Mid-size luxury segment, also referred as executive cars will witness gains over 5.5% up to 2024. Rising demand for high performance wheels from this segment with increasing trend for automobile weight reduction will fuel the industry growth. Executive cars are positioned as premium cars due to increased wheels usage along with advanced technology conveniences. Original Equipment Manufacturers (OEMs) accounted for more than 80% of the overall high performance wheels market share. Growing automobile production to meet the rising consumer demands is a key driving factor of the industry growth. Increasing manufacturing facilities and capacity expansions mainly in the emerging economies will positively influence the demand. Rising demand for the customized and aesthetically appealing vehicles will drive the high performance wheels market from aftermarket. Low costs and easy availability of the replacement components have supported the product penetration in this segment. Increased low-end passenger car consumption coupled with increasing road accident rates are the fuelling factors of the industry growth. 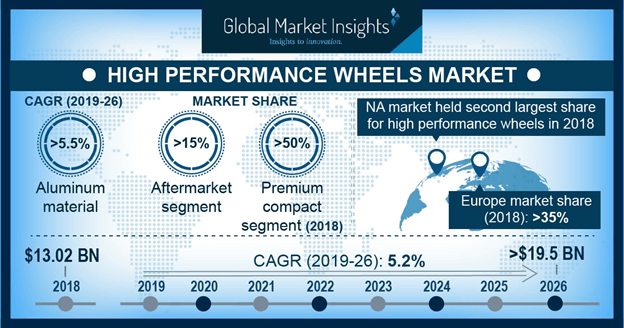 Europe high performance wheels market will worth over USD 7 billion by 2024. Increased premium vehicles usage along with government initiatives and policies to promote lightweight vehicles are the key factors enhancing the product penetration. Recovery from the economic recession has enhanced stability of the Europe automotive industry. U.S. high performance wheels market was worth around USD 3 billion in 2016. Technological advancement, large presence of manufacturers and easy raw material availability are the key factors supporting product development. Stringent emission protocols promoting vehicle weight reduction and fuel efficiency enhancement will trigger the regional demand. Asia Pacific high performance wheels market will witness growth over 7% up to 2024. Extensive resource availability and increasing manufacturing facilities particularly in China and India will propel the industry growth. Increasing disposable income and shifting consumer preference towards luxury cars and supercars has encouraged the product penetration. 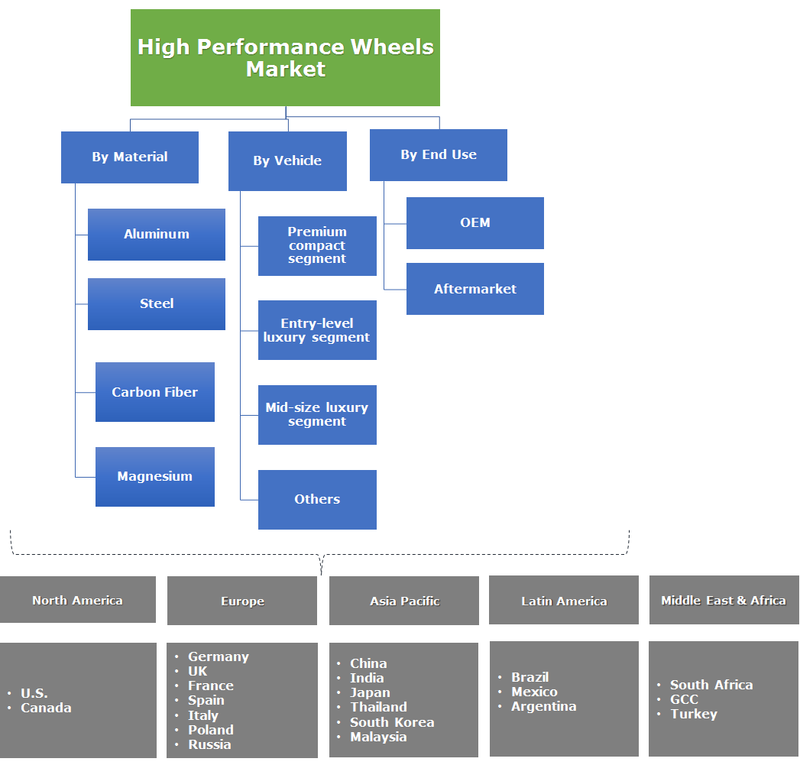 Global high performance wheels market share is fragmented with the large presence of regional manufacturers. Carbon Revolution, ALCAR Group, OZ S.p.A, Steel Strips Limited, Nutek Forged, Mandrus Company, Euromax, Topy Industries Ltd and Accuride Corporation are the major industry players. Mergers & acquisitions, product portfolio expansion and product innovations are the major strategies adopted by key players to expand the geographical coverage. Other notable manufacturers include Alcoa, BBS Kraftfahrzeugtechnik AG, SuperAlloy Industrial Company Ltd., United Group, Konig, Fikse, RAYS Co. Ltd, Ronal AG, CiTiC Dicastal Wheel Manufacturing Co and Enkei. High performance wheels offer significant properties including withstanding impact forces, improving wheel performance, and extended durability. Evolution of carbon fiber to reduce the overall weight of vehicle, improve fuel efficiency and enhance handling has influenced the product trend. Significant industry participants are investing in research and development to advance their product and technology will shoot the industry growth in coming years. Globally, automotive premium leading brands are looking to achieve substantial growth in the forecast period by launching advanced vehicle models. Automotive industry is focused on a variety of mid and lower models and low-value added assembly actions particularly in Asia Pacific.